What is Low E....Argon Gas....What benefits do they carry? Since the heat flow resistance of still air is much greater than that of glass, a glass unit made of two panes enclosing an air space will have about twice the insulation value of a single pane window (half the heat loss). By including Argon gas between the panes of glass and sealing it in, the insulating performance of your double glazing increases. Argon gas is denser than air and acts as a greater barrier to heat loss and heat absorption in the home. Argon gas is a naturally occurring inert gas, and it's not harmful to you. Low E glass is more efficient at keeping the heat inside the home during winter and preventing heat absorption during the hot summer months because it reflects long wave radiation. 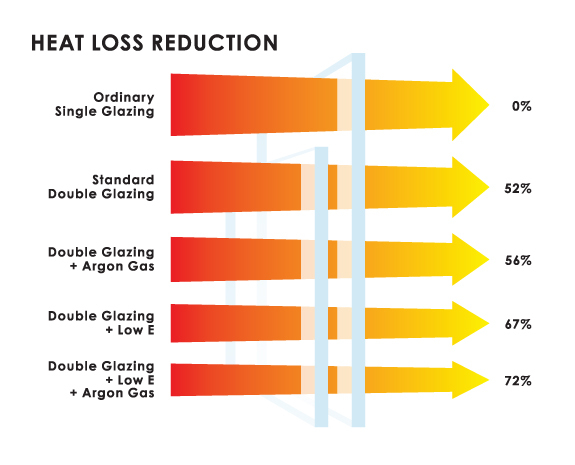 Argon gas and Low E glass, when used together in an Insulating Glass Unit (IGU), will deliver a superior insulation performance.